Ok so I'm not sure the best forum to put this in, but the other day I came home from being out of town for the weekend. There was about 5 plants sitting on my doorstep. It looked like someone had pulled them out of the ground and left them there for me. It's normal for me to come home and have chilies or tomatoes sitting out there. Or even the occasional small plant that someone wants me to grow for them. But these were different. They looked like weeds or something. I put them in a bucket with water but didn't have time to plant them, or even figure out what they were. Blackberries? Is it possible that blackberries have grown from your property into someone else's, and that person is putting the pulled-up plants on your porch??? ah... you may be onto something. I don't have any berries or anything at my house. But the guy across the street works at a berry farm. I need to ask him if he put them there for me. I'll go plant them outside right now and see if anything cool comes up. I know they are a bit thorny, and I think blackberries have thorns right? 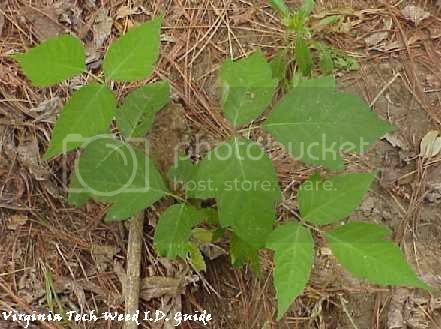 Ahh ... those leaves look an awful lot like this pic of poison oak from Virginia Tech. I suppose it's possible that they're something like blackberry, although I've never seen blackberry leaves 'mittened' like the ones in your pics. I have heard that young Virginia Creeper plants are sometimes mistaken for poison ivy, but I have no experience with Virginia Creeper. I'll stick with "blackberries" for now. Lots of people hereabouts mistake blackberries for poison oak, esp. in the fall, when poison oak turns color and blackberry leaves turn brown. Looks like they have thorns. The Poison ivey around here is thornless. Do the plants in the pictures have thorns? I may be just seeing things... Looks like berries to me. blackberry or raspberry relative for sure. not poison oak. Kisal wrote: Ahh ... those leaves look an awful lot like this pic of poison oak from Virginia Tech. I suppose it's possible that they're something like blackberry, although I've never seen blackberry leaves 'mittened' like the ones in your pics. I have heard that young Virginia Creeper plants are sometimes mistaken for poison ivy, but I have no experience with Virginia Creeper. YES that is poison oak. Virginia Creeper has 5 leaves and the vine grow up the side of trees and houses. Last edited by Gary350 on Wed Sep 15, 2010 11:21 am, edited 1 time in total. I second a bramble - blackberry or raspberry -- for #1 and #3. #2 looks like grape leaf to me. I'm uprooting blackberry canes that arched over, touched ground, and started rooting in unwanted places myself.... My raspberries have started popping up somewhat beyond the designated area too.... In my experience, if you leave them alone, they'll take the opportunity to establish their root system and settle in during the autumn months and early spring. Best to get them out now. ...and plant them to start new beds. 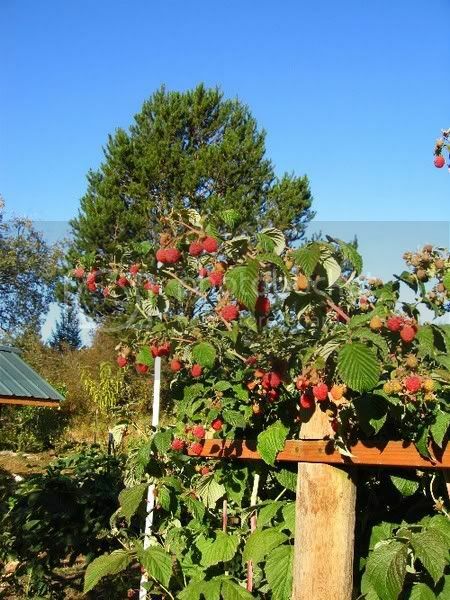 ok so now that we are pretty sure that they are a berry, is there a good way to plant them so that they live. They have been sitting there since last night or early this morning. I threw them in the ground about 2 hours ago, I just am not sure if I need to do something else to make sure they don't die. Good fertile soil with a top dressing of compost / manure every spring works for me. I too think raspberries. They are tough. Just go plant them and water well. I have those too, some from my neighbors yard grew into ours and goes through the fence. I tried to transplant a couple of them into a pot just to get it into a different place, and they died! I'm getting another sprout in our own yard (instead of the stalks just reaching into our yard) so I'm a little excited. They taste so good! Next time I'm not gonna try to transplant it haha. ~I learn as I go... I just wish that would I learn faster. ~Well at least I have my backups... nope they're dead too. ~Outdoor gardens are very good when you have a Bearded Dragon that can just chomp her fill when she's hungry. Weeds! Weeds! Weeds! - new to veggie gardening - need help! !